Do you know how to fix a leaking toilet? Leaks can be a little deceptive and it is not always easy to tell where they are coming from. The first step is troubleshooting your problem. The 'Toilet Leak Troubleshooting' section below, will help you to do that. After that, you want to get the needed parts and tools. With everything thing you need, just follow the instructions provided to repair your leaky toilet. Not sure if your toilet is actually leaking? See the article on 'Fixing Toilet Problems' for a complete listing of potential problems and solutions. The four possible locations are: (1) The Fill Valve inlet. Usually just requires that you tighten the tank seal nut. (2) The Flush Valve seal. Many times , tightening the bolts will solve this problem. (3) The Toilet Flange seal can leak at the floor. This requires pulling up the toilet and replacing the wax ring. (4) The water valve or supply tube can also leak. Tightening may fix it, replacing washers or replacing tubes and valves may be required. What Can You Save? - Leaks can be a little more challenging, even for a repairman. Initially it will cost you $50 to $100 for a service call, plus parts. If it takes longer than the initial time period (this varies), they generally charge you in fifteen minute increments. $15 to $35 per fifteen minute period. It is unlikely that you need a new toilet if it is just leaking. Assuming a repair period of one service call plus one half hour the Savings would be $80 to $170. Parts would be extra of course, and marked up at a repair shop's pricing. How Hard Could It Be? - Depending on where the leak occurs the difficulty level can vary. These repairs will have a Difficulty Level of: A Bit of Work. These repairs require a Skill Level of: Handyman. For and explanation of the terms in this section, see 'How to Use This Site'. Check the Simple Things! - We will cover it in the steps below, but tightening things up is usually pretty simple. If something is obviously loose, get a wrench and tighten it. It may be as simple as that. What Can Go Wrong? - Leaks mean water, water can be a problem. Left unattended, leaks can damage finishes and structural elements. Letting a leak go for a long time can do thousands of dollars of damage. Fixing it quickly will always be the best course of action. Anything that can be damaged by water should be removed from the area before the repair is attempted. Getting the toilet partially repaired before it gets too late or the parts store closes can leave the toilet not operating. One trick is that a toilet can be flushed by dumping a couple of gallons of water quickly into it from a pail. This mimics the normal function of the toilet tank. The descriptions below help you to locate the leak and act accordingly. Try to locate the leak before you take action. A leak at the toilet flange may only leak when the toilet is flushed. Use a dry cloth to soak up the water and then use your finger to determine where the leak is coming from. You hear a trickling sound inside of the tank. This is especially noticeable when it is quiet. This is usually accompanied by the toilet tank refilling periodically. This problem is related to the toilet flapper and the toilet flush valve. The toilet flapper raises when the toilet is flushed. After the water has drained into the bowl, the flapper closes. It seals against the rim of the flush valve. The seal between the flush valve and the flapper is the only thing keeping the water inside of the tank. When this seal fails, you have a leak. The articles 'Toilet Flapper Leaking' and 'Toilet Flapper Repair' provide information on all of the issues associated with your toilet flapper. This includes instructions on how to fix it. I have a leak at the base of my tank, where it connects to the toilet bowl. The toilet tank is mounted to the base unit with bolts. There is a large seal between the tank and the bowl. This seal is compressed by tightening the bolts that hold the two porcelain pieces together. Loose tank bolts can cause the seal to leak. Since the seal is made out of rubber it can also dry out and crack over time. A cracked or worn seal can also leak. Another potential problem is the bolts. Some toilets use bolts that have a rubber seal around them. There are individual holes in the bottom of the tank for each bolt. You can have the same problem here, a loose bolt or bad seal at the bolt can cause a leak. The article 'Fixing a Leaking Toilet Tank' has complete instructions for tightening the toilet tank bolts and replacing the seals if needed. I have a leak where the water supply connects to the tank. There is another hole in the bottom of the toilet tank for the toilet fill valve. The toilet fill valve regulates the amount of water that is stored inside of the toilet tank. It needs to be connected to the homes water supply. The water supply line for the toilet is leaking. There is water on the floor around the base of the toilet. Toilets use a lot of water to operate and water needs to be stored. It is not suprising that they have lots of spots that can leak. Hopefully, you were able to identify your problem and get it fixed. Did not find an answer to your problem? 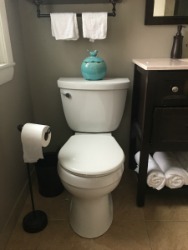 See the article 'Troubleshooting Toilet Problems' for a listing of all if the toilet issues you might encounter.